This is the first of a series of posts where I identify a social media tool that I use, explain its benefits, and suggest why you should use it to be more productive in your life. My viewpoints are interspersed with the words of industry leaders who are the people behind the tools. Their words are extracted from the book, “Web 2.0 Heroes,” by Bradley L. Jones. If you’ve never heard of Web 2.0, which is jargon for social media, click here for a 5-minute lesson. Short Message Service, or SMS, is a 15-year-old technology that enables people to exchange text messages between cellphones, personal digital assistants, and other mobile devices. 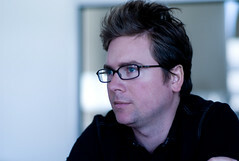 In 2005, Biz Stone and Evan Williams, two entrepreneurs who met at blogging software company Blogger, proposed merging the web with SMS. They suggested that as an alternative to people sharing information on blogs and sharing information on mobile devices, why not combine the two? At the same time, a mutual friend named Jack Dorsey wanted to merge blogs with computer-based instant messaging software tools, like AIM, ICQ, and Yahoo Messenger. The trio realized they could hone their ideas into a singular product which I use today. With human ingenuity, Ev and Jack and Biz have shown that web connectivity is not exclusive to the computer because even if the power is out at someone’s home or business, people can still communicate with their network via SMS. This wasn’t possible before Twitter. About 10 to 20 times a day, I send out short bursts of information, limited at 140 characters, to my network of “followers” who are interested in what I have to say. Maybe they like what I write on this blog. Maybe they like a comment I wrote on another person’s blog. Maybe they followed me from another social network. Maybe they used Twitter Search or Tweet Scan (similar to Google or Yahoo) and saw a keyword in one of my messages and decided to join my network. Maybe they saw a message I sent to one of their followers and chose to follow me, too. Fact is, I don’t know why people follow me unless they tell me or unless I recognize their names when I receive email notifications of new followers. I’ve exchanged messages with some of them, but I have about 400 people who currently follow me. By contrast, I follow about 200 people who mostly work in public affairs, technology, or the government. On the latter, I point you to prior entries of mine on the power of nonpartisan transparency of the U.S. Congress tweeting. I send most of my messages via the web, with an occasional message sent as SMS from my cellphone; I am charged for this through my Verizon cellular plan. Usually, I send my messages from a desktop client developed by a third-party called Twhirl. This software program synchronizes the website feed to my computer desktop, so I merely click a button on my Windows taskbar and it opens, allowing more freedom to multitask without having a web browser open. The neat thing about the Twitter architecture is that outside developers are encouraged to create “application program interfaces” in the form of software programs that can be installed on a computer or run from a website and enable a new and exciting way to use Twitter. It’s along the lines of how Microsoft built Windows but other companies built software that can run on Windows. The company claims that 60% of Twitter traffic stems from these third-party APIs, like Twhirl. The corporate business model, Biz says, is “diversified” and “agnostic” to enable cooperation among other firms to enhance the Twitter user experience, to make it more reliable, and to boost partnerships with other social networks to converge their shared user base; Twitter applications can run on Facebook, for instance. If you look at my recent outgoing messages, you will see a mix of “status updates” where I note what I’m doing, how I’m feeling, whether a YouTube video is making me laugh, or if a news story disappoints me. All of my followers won’t see all of my tweets, nor I theirs. Twitter is like CB radio chatter; you tune into what you want and when you want, responding at your whim. Unlike CB chatter, Twitter is part of the social web experience and everything online is archived. Everything published online is saved online. Anything that anyone can see online today will be seen online as long as the web is alive. Some people, due to paranoia or work issues or who knows why, don’t want the world to see their tweets and check a box after signing up to “protect” their messages. Biz says about 90% of users do not protect their updates. “People find value in the openness,” he says. He calls this value “social alchemy,” defining it by Sally writing a mundane message, such as going to the XYZ golfing range at 5pm, not expecting a reply back but getting one from Jill who writes she is also going to the golfing range and would Sally like to grab a coffee because Jill saw they both write about cats? I do. In recent weeks, I’ve sent messages and received messages to and from members of Congress, employees in the U.S. intelligence community, employees in UK Prime Minister Gordon Brown’s office, social media marketers who live in a 5-mile radius from me, and former high school classmates. turn into a business deal or a job lead. The traditional way of colleagues gathering around the water cooler to discuss whatever is on their minds and make plans for after-work drinks has shifted to the web; only now business professionals can “type” to colleagues, clients, vendors, partners, job recruits — pretty much anyone who has access to a computer or a mobile device and wants to engage in a dialogue or receive alerts to Red Cross disasters or fire damage. Here is a Twitter “infomercial” that was released a few weeks ago. It helps explain how regular people like you and me use Twitter. After watching it, I’m curious what you think of the video. May I suggest you add to the social web experience and add a comment below? If you found any value in this entry, please let me know. If we are not already Twitter friends, do you tweet? Why or why not? Ari…I have been trying to figure out how to use Twitter in my world. Just last night I was trying to explain it to my husband and found myself drawing a blank. He’s a web novice so I have to choose my references carefully… I think your references will prove helpful in my next attempt. Thanks!